As discussed in our article, “Cannabis Fertilizers, Supplements, and pH”, the pH of the nutrient solution affects the solubility of the nutrients in the solution. If the pH of the solution that you add is outside of the acceptable range, some nutrients will be unavailable to the plant. Coco does not buffer the pH of nutrient solution as effectively as soil and therefore it is critical to set the pH of the nutrient solution inflow within the range of 5.5 to 6.5. Because different nutrients are soluble at different pH, it is best to allow the pH to drift up and down within the range on successive fertigation events. 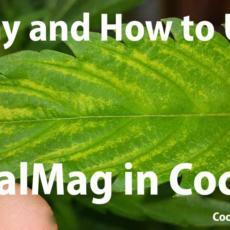 During the majority of the grow your inflow pH should fluctuate around an average of 5.9. However, during the seedling and ripening phases it is best to target somewhat higher in the range (6.1-6.3). There are two options for measuring pH: a color indicator test which uses liquid drops, or a pH meter. Other pH tests or meters, such as test strips, are ineffective. Many novice growers purchase two-prong “triple meters” that are supposed to measure “soil pH” along with water and light, these, in particular, are useless. 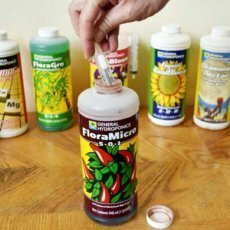 You do not need to test the “soil” or the coco, you need to test the pH of the nutrient solution that you are going to add. These are a cheap and easy solution to get started. Many pH adjustment kits come with a small liquid drop color test kit. These are an excellent option to start managing pH. The color test is not particularly accurate, but pH does not need to be a specific target and it is actually better to allow it to vary from fertigation to fertigation. The drawback to the drops is they become practically useless if you add a supplement that significantly darkens the color of the nutrient solution. These range from cheap meters at about $15 to expensive models over $100. Unlike EC meters, the technology involved in measuring pH is sensitive and it is worth avoiding the cheapest meters. Cheap meters are unreliable and have short life spans. That said, you do not have to buy the most expensive meters either. We use and recommend this Apera Instruments pH meter. It comes with small jars of calibration fluid and is easy to use and store. All pH meters require maintenance and calibration. Many meters come with powder to mix and use to calibrate the meter. These powders are useless unless you have laboratory grade instruments to measure the amount of water to dissolve them into. It is far better to purchase calibration fluid that is premixed at an actual laboratory. To maintain the meter between uses, it should be stored in either storage solution or calibration fluid. This can be done by putting a small amount of the solution in the cap of the meter or in the bottom of a jar and storing the meter in that jar immersed up to the “immersion line”. Most of the nutrients and supplements that you add to the nutrient solution have an impact on pH. The base nutrients lower the pH and certain supplements like silicon and SM-90 raise it. Whether and how much you will have to adjust the pH of your nutrient solution depends on the pH of your starting water and your specific recipe for each stage of growth. Give nutrient solutions several minutes to stabilize before measuring pH. 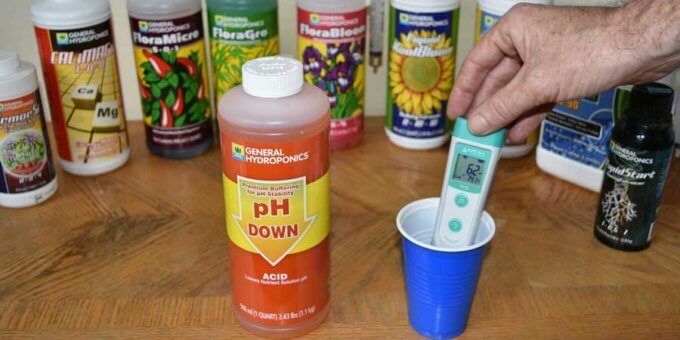 To adjust pH it is best to use a product specifically designed for pH adjustment of horticultural nutrient solutions. 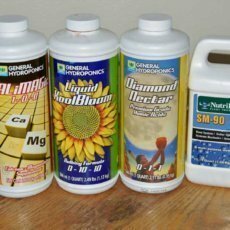 We use and recommend General Hydroponics “pH up” and “pH down” products. They allow significant pH adjustment with very low doses and have minor impact on the EC of the nutrient solution. It should generally require less than half a milliliter of either product per gallon to successfully adjust the pH. After adjusting, be sure to re-measure to verify. 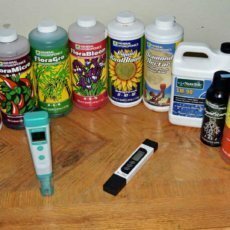 We recommend recording inflow pH values in your grow journal. Although it is critical to adjust the pH of the inflow, you should not be concerned with the pH of the run-off water. Your only concern with pH is always providing nutrient solution (inflow) that is in the appropriate range. Many growers make the bad decision to provide nutrient solution that is outside of the acceptable range in a misguided attempt to correct run-off pH values. This can destabilize the pH of the nutrient solution in the root zone and make nutrients unavailable. To avoid this common pitfall, simply ignore the pH of the run-off. Now my question… Is your run-off pH actually 7.6, or is this just hypothetical? I encourage you to come to our grower’s forum to continue to the conversation! Thanks for the reply and that was hypothetical and i have another question for you.This is my first time hand watering I have done 4 grows with coco in autopots and was getting problems that I couldn’t fix so ive switched to airpots with coco,and watering once a day and im putting in 1.5 ec and the outflow is 1.3 ec with 30% runoff.What causes the lower ec runoff.Ive read a number of books on growing cannabis and your book was by far the most informative i learnt things in your book that ive never read before thanks well worth the money. When the run-off EC is lower than the inflow it suggests that the plant is absorbing nutrition well. However, it is usually temporary and I expect that if you continue with 1500 inflow, your run-off will soon equal and then pass it. That is exactly what I would do. It is a good position to be in, however it may start to rise rapidly when it does rise, so remain vigilant. I am really happy that you like the book and would be grateful if you could leave a review on amazon. Hey @spider Thank you for the review! I am flabergasted by the run-off EC of 6.8 (6800)! Organic nutrients can burn your plants if they are soluble, however the guano that is contributing the most should not burn the plants directly. It may provide too much nitrogen if still present in large quantities during flowering. I do not use fertilizer amendments in the coco because I like to have complete control over the Nutrient Element Ratio at all times. I’d continue to fertigate and use a good dose of CalMag since you saw evidence of issues there. But I would keep the inflow EC pretty low… around 1.0 (1000). 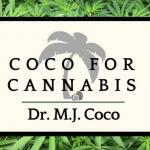 Since the plants are happy you should be able to veg there and I would hope that the coco is behaving more normally by the time you get to flowering. I hope you start a journal in our Grower’s Forum… You can post pics there and we’d love to follow your progress!